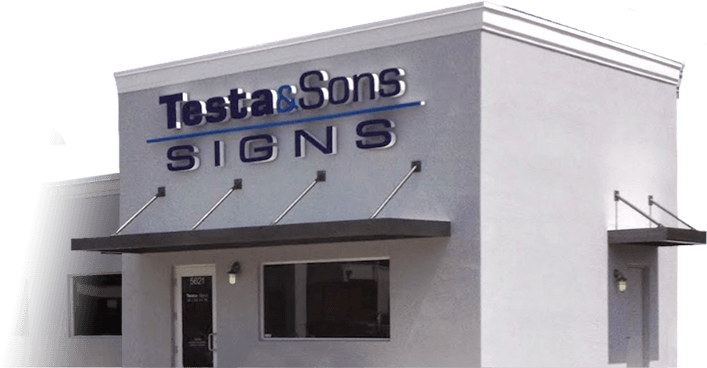 Testa & Sons Signs is a family-owned sign company located near Hollywood. We offer businesses in and around Hallandale Beach our professional sign design and installation services. We work on projects of all sizes and can deliver high quality, custom signs to your business and install them as well! When you need a specific sign design created, you can trust that Testa & Sons will have you covered. From manufacturing particular street signs that are approved by the Department of Transportation to creating custom business signs in channel letters, we have created a variety of different signs for all types of businesses and corporations. We are dedicated to making the most effective and durable signs. If you have any work you need with custom signs in Hallandale Beach, then turn to Testa & Sons. We care about each sign we create, which is why every product we make is high in quality. To get more information on our custom signs and installation services, contact the professionals at Testa & Sons Signs today!